As more farmers and gardeners take an interest in permaculture, seed savers’ networks are becoming a vital way to preserve heirloom varieties and protect our planet’s biodiversity. Although not as visible as the farmers’ markets that line our neighborhood sidewalks on Sundays, they’re an integral part of the farm-to-table movement. Seed savers and seed libraries are pushing back against the growth of monoculture and the trend toward patented seed varieties. And unlike the Svalbard Global Seed Vault – which stores seeds in an Arctic bunker – they keep rare varieties of plants in the ground year after year, continually adapting to the changing climate. 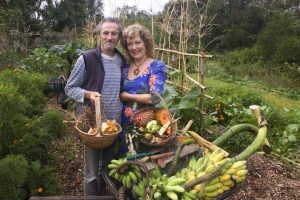 Thirty years ago, Michel and Jude Fanton lived on a permaculture farm in New South Wales, Australia that they called “Mimosa.” They worked closed with Bill Mollison, who developed the concept of permaculture and often taught classes on the farm. After informally swapping seeds, tubers, and other cuttings with nearby farmers, the Fantons decided to start a formal Seed Savers’ Network. Mollison told them to make it a national organization. Since then, the network has catalogued over 8,000 seeds from Australia, and has over 100 local networks. 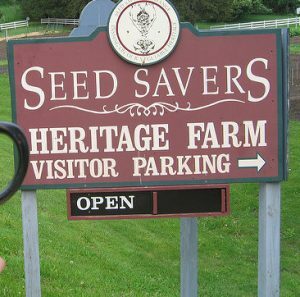 What sets the Seed Savers’ Network apart from seed banks or libraries is that encourages interaction between farmers. Rather than store seeds out of context, experienced and casual gardeners alike can swap not just the seeds, but the stories behind them: How long have they been growing this variety? What conditions does it thrive in? Michel and Jude Fanton continue to run the network from their permaculture farm in Byron Bay, Australia. In addition to tours and internships, you can even book a stay in one of their guest apartments. Their garden has over 1,000 plants, including eucalyptus, bamboo, and banana, and many sub-tropical varieties from South America. In the U.S., one of the largest networks of its kind is the Seed Savers Exchange, a non-profit that was founded in 1975 by Diane and Kent Whealy. Its headquarters, near Decorah, Iowa, maintains over 25,000 seeds in a below-freezing seed vault, one of the largest collections held by a nongovernmental agency. Called Heritage Farm, the 890-acre property is one of the “most diverse” farms on the planet. It has over 900 kinds of apple trees, as well as rare chickens, cattle, and pigs. 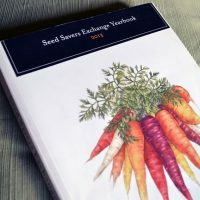 Each year, the organization releases a Seed Savers Exchange Yearbook, containing over 15,000 listings of the seeds available from its members. Gardeners can also order from the online seed exchange, which includes details of the seed’s history, a description of the plant’s characteristics, and more. Want to learn more about seed saving? Check out the website for the Seed Savers Exchange, or look into a local seed library or network near you. While it costs money to order seeds on the exchange, seed libraries are generally free and may ask patrons to donate a collection of seeds after the growing season. This is a great way to learn how to save seeds! If you’re interested in starting a seed library of your own, take a look at this post on some of the legal requirements that apply to seed exchanges in some states (via Shareable). ← 50% off Magazine Back-Issues, October Sales, & a Focus on Diversity!